I think it would be fair to say that most folks who visit this site are gardeners or "wanna-be" gardeners. I also think it would be fair to say that the majority of them garden in the traditional way, basically growing directly in the soil or in containers. Let's step outside the box and take a look at some methods for lack of a better term might be termed "unorthodox." I think you will enjoy it and might have some fun trying some or all of them. This may not seem unorthodox to many of you with the recent surge in popularity of SBG. There has been a forum dedicated to strawbale gardening here on DG for several years. I've been doing it for a number of years and I find it to be a fun, productive way to grow "things." When I say "things," I mean you can grow almost anything in a strawbale that you can grow in a conventional way. In my particular case I have a couple of locations on my typical city lot which are not suited for in-ground growing. I plopped down a couple of bales in those spots and I now have two more productive growing areas. I'm an heirloom tomato "nut" so I have been growing a couple of tomatoes in each bale. The choice is up to you plant whatever your heart desires. One thing that surprised me as I did some research for this article is that strawbale gardening is said to date back to the ancient Egyptians and Aztecs who used it as a way of growing plants in wet conditions which would not support normal soil planting. Strawbale gardening got started here in the US in the 1990s due to the number of organic gardeners who planted in the bales as they were decomposing in their compost piles. 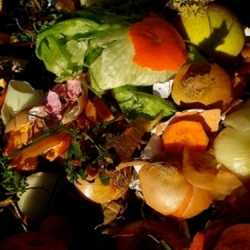 The premise of SBG is that the plants feed on the decomposing straw in the interior of the bale. In my opinion preparation is the key to successful SBG. Bales are readily available at nurseries or feed stores or coops. Each is about 2 by 4 feet. . They typically cost 2 to 5 dollars. Here in SE Michigan I pay $4 each. 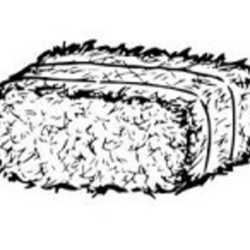 Plan on planting 2 to 4 large plants or 4 to 6 small plants in each bale. Here's how I do it here in zone 6. You can adjust your timing to fit your USDA zone. Around April 1, I purchase my bales and place them in their permanent locations for the season in full sun. Once the bales become saturated, they are extremely heavy and very hard to move. Count backward for 15 days from your planned planting date and we'll consider this as Day 1. Days 1-3 Water the bales thoroughly and keep them damp. Days 4-6 Sprinkle each bale with a 1/2 cup of a high nitrogen fertilizer like ammonium nitrate (34-0-0) or ammonium sulfate (21-0-0) per day, and water it well into the bales. If you'd like you can substitute blood meal (13-0-0). I am using urea (46-0-0) this year for the first time and it is working well. Days 10-13: No more fertilizer, but continue to keep the bales damp. Day 14-15 stick your hand into the bale. If it has cooled down to less than your body temperature you may safely begin planting as soon as all danger of frost has passed. You can either start seeds or use transplants. If using seeds, top dress the bale with about 1 inch of seed starting mix, plant your seeds, water in and keep well watered. If using transplants use a garden trowel to open a planting hole. Insert the plant and using your ands push the hole closed around the roots. Again water well and keep well watered. I fertilizer my bales every 2 weeks with a balanced water soluble fertilizer (20-20-20). Do not allow the bales to dry out. Some folks lay soaker hoses on the bales in order to keep them watered. 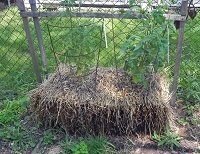 I support my tomatoes by inserting a tomato cage directly into the bale. Last fall as I was cleaning out the garden I notice that the roots on the tomatoes grown in the bales were 3 times as large as the tomatoes grown directly in the soil. Give SBG a try; once you try it you'll be hooked, too. This is a fun project, especially if you get children involved. 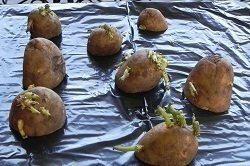 So often nowadays, many kids have no idea where their food comes from, but this is an easy way to show them how to grow potatoes in a container. For a container, you'll need something fairly large, such as a 5-gallon plastic bucket. I have a large 20-gallon pot that I use as well as a plastic tote box. Good drainage is critical for the cultivation of healthy potatoes so you'll want to cut or drill a series of large drainage holes in the bottom and bottom sides of your container. I grow potatoes from seed potatoes, ones that haven't been sprayed to stop their seeds from sprouting. You can usually find seed potatoes at most full service garden centers, feed stores or farmers' co-ops. Fill the container about one-third full with a 50/50 mixture of garden soil and compost. Cut seed potatoes into chunks having at least 2 eye each. Allow the pieces to dry and callous over, about 2 days. For a large tote or my 20-gallon pot I plant 6 pieces of potatoes. 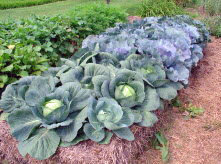 Cover with 3 to 4 inches of soil-compost mix. Keep the container well watered. Soon you will see little stems pop through the soil. Mound up more soil/compost mix, but do not to cover the leaves. The leaves need sun and air exposure. As the potatoes continue growing, continue adding soil-compost mix until you reach the top of the container. 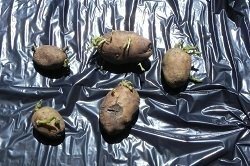 After about 10 weeks or until the plants flower and start to yellow, the potatoes should be ready to harvest. Carefully dig down with your hands to inspect the top-most layer. After you've confirmed your suspicions, dump the barrel out on a tarp and inspect your bounty. After the first harvest, keep a few potatoes to use as seed potatoes next year. Feel free to experiment with different containers, different seed potatoes and watering methods. This is also a fun project for kids. I think most of us have a milk crate or two lying around. Why not turn it into a container for plants? 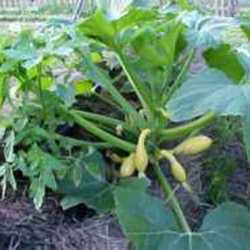 I like to grow cucumbers in mine. Cukes can take up a lot of space in the garden, and I find that growing them vertically in a milk crate saves space and produce a bumper crop. I believe that the vine being exposed to a lot of sunlight helps to produce a lot of fruit. 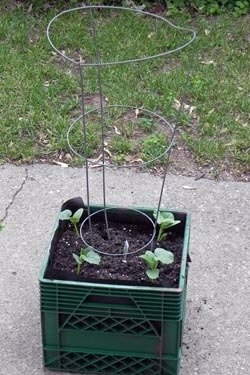 I use a tomato cage inserted in the soil for my cukes to climb on. I like to spray paint my crates but that's not necessary. The first step is to cut some landscape fabric to line the crate. 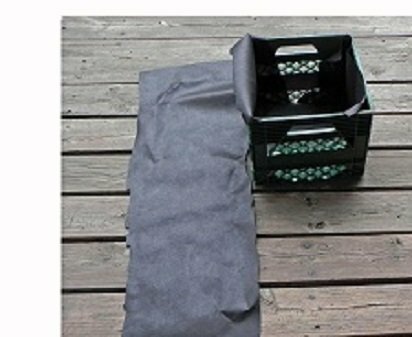 After lining the crate with the fabric, add your soil medium. I like to use a mixture of half potting mix and half ompost with some worm casting added for good measure. Almost anything may be planted into the crate. Make sure to keep it well watered and in a location with full sun. This is another method taking off like wildfire in some parts of the country. I sometimes think that the country is being overrun with pallets, and this is a great way to recycle them and grow some great plants as well. 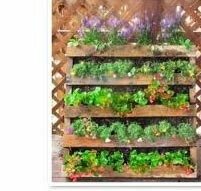 Pallet gardens are easy to construct, they can be grown vertically or horizontally, as there's no soil to till or weed. This is a perfect project for young kids, especially when if child can get their own pallet! To find free pallets, call your local garden supply store or any store that carries large equipment. If you go to the rear of many stores near the trash dumpsters you will often find stacks of pallets that the store owners are more than happy to give you. Look for a pallet that has HT stamped somewhere on the pallet. This means the pallet was heat treated, or kiln dried as opposed to chemically treated. 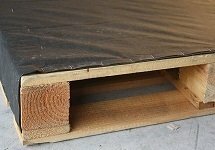 You want to cover the bottom of the pallet with the landscape fabric with has been brought over the sides of the pallet and stapled to the wood. Position your pallets, allowing at least one foot along each side of the pallet so you have room to work. Add your soil to the inside of the pallet, filling completely to the top. The soil will settle once watered. Plant seeds or starts according to planting instructions. Tip: If you need a wider row for larger vegetables like squash, remove a plank. Use a marker to identify the plants in each row and when you planted. Water. A soaker or misting hose is ideal for new seedlings. You may also place your pallet into a vertical position to save space and grow your plants vertically. Those of us who have limited growing space need to take advantage of the space we do have. Every nook and cranny needs to be utilized. This is a great way to grow a few extras in some previously unused space. A vinyl gutter is attached to my fence, filled with potting soil and planted. At the present time I'm growing radishes and mini carrots. After these are harvested I'll plant spinach and lettuce as a fall crop. Vinyl gutters come in 10 feet lengths. You can use the entire length or cut it to fit your own situation. End caps are snapped into each end. Drill drainage hole in the bottom of the gutter. I attached a 2X4 to my top fence rail using stainless steel hose clamps, then I screwed the gutter to the 2X4 using galvanized screws. Cut a piece of landscape fabric to lie in the bottom of the gutter. Fill with potting mix, plant you seeds or transplants, keep watered and you're done. I hope I've given you some new ideas. Try a few--I'm sure you'll have fun doing them!